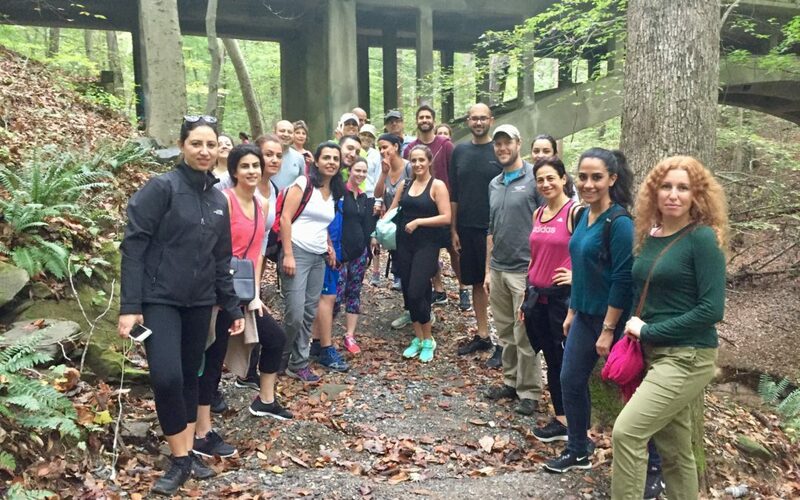 On Saturday, Oct 14th the American Friends of the Lebanon Mountain Trail (AFLMT) and the Worldwide Alumni Association of the American University of Beirut (WAAUB)-Greater DC Chapter held a one of a kind, first joint hiking event in Rock Creek National park, Washington DC. The AFLMT seeks to actively engage with the young Lebanese American population in the US, and introduce them to the Lebanon Mountain Trail (LMT) through local outdoors activities- among other events- that relate to the Lebanon Mountain Trail to the mission of the AFLMT and the Lebanon Mountain Trail Association (LMTA). For our hike, the AFLMT gathered friends and fans of the LMT, hikers who had previously walked on the trail, champions of the LMT cause and other individuals interested in visiting the LMT, and jointly walked with AUB alumni club of Washington DC, in an atmosphere of active exchange among all participants. The hike kicked off from the historic old stone house and Pierce Mill of the park and followed a familiar loop along the Western Ridge Trail. Most of the AUB alumni and their friends had not heard of the LMT, and during this hike, learned about the 470km long Lebanon Mountain trail, now an international touristic destination for long-distance hiking and cultural discovery. They realized the importance of the Lebanon Mountain Trail Association (LMTA) work in protecting, preserving and promoting this national trail, its mountains, and all the natural resources and heritage it carries. Our walk continued by foot to the close by Lebanese Taverna restaurant in the Woodley Park neighborhood, where we gathered for an exquisite lunch with Lebanese flavors. All participants received a copy of the latest LMT Society magazine. Lebanon boasts an important and influential diaspora in the US, that has historically supported its homeland on the financial, political and social aspects. The AFLMT plans to organize similar events in additional major cities in the US, to recruit volunteers and friends of the LMT, and to advance the LMT cause locally and internationally.